AirPrint will help you to print from your iPhone and iPad. One of the only things that’s not cool about iPhones and iPads is that they offer no way at all to print. You can’t print files or documents off directly. However, in the November 2010 software upgrade, they offered something that will help. The upgrade has a new feature that’s called AirPrint. If you can connect to an ePrint-compatible printer through a Wi-Fi connection, you can print things from your iPhone or iPad. Before, the only way you could print anything from your iPhone or iPad was to send the file to your computer. You could email it or use a program like iTunes syncing or MobileMe. Everybody’s been waiting to see if they would offer some kind of print option. It seemed like the next logical step, and now it’s happened. In November 2010, they released an iOS 4.2 upgrade that allows you to print using a printer and a wireless connection. The upgrade had lots of new features, but the coolest one for iPhone and iPad users is the AirPrint feature. What you need is a wireless connection and a printer that can use e-Print. If you’ve got this, you can print out photos, emails, documents, files, web pages or anything else you want to. One of the first companies to use the AirPrint feature is Hewlett Packard. The feature can only be used with printers that operate with a Wi-Fi connection. Most models that are coming out now can do this, but if you’ve got a printer that’s a few years old, it may not be able to. 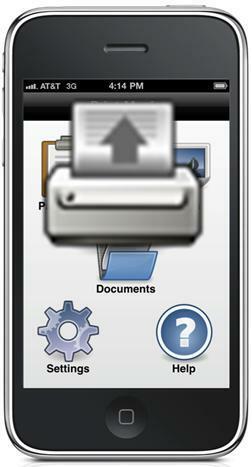 The only trouble with the third party apps is that most of them are designed to only print certain types of documents. For example, one application may only print web pages. Another will only do photographs or documents. There isn’t a third party app that prints everything like the AirPrint feature does. Because they only print one certain type of file, make sure that the application you choose is right for you. Spend a little time reading about each one before you make your selection so that you can be sure it will meet your needs. Here are a few of the best print applications available there. PrintCentral, developed by EuroSmartz, will print most types of documents. This includes web pages, contact, emails, email attachments, photographs, regular documents and files. You can use PrintCentral if you’ve got a printer that uses Bluetooth, Wi-Fi, USB or Network. If you get WePrint installed on your computer, you can easily print from your iPhone or iPad to your computer’s printer using its 3G internet connection instead of Wi-Fi. With this application you can print from anywhere. This program is very user-friendly but it takes a little work to get it set up with your computer. The only downside is that it’s limited by your iPhone or iPad’s operating system limitations. This means that certain types of files can’t be printed using this software. However, you can find lots of other applications at Apple’s App Store that will do specific files. Look for other apps by EuroSmartz. Print Magic lets you print from any printer that has a Wi-Fi connection. You can print any file or document that the iPhone or iPad allows you to cut and paste. This includes PDFs, Word files, web pages, images and lots of other stuff. You just copy and paste what you want to print into the Print Magic application and hit the print icon. This gives you a pretty wide range of different file types that you can print using the program. There are a few free applications that you can use. They’re made specifically for certain printers. One is Hewlett Packard’s HP iPhoto 3.0 app. You can use it to print PDF files, photographs and a couple of other document types directly to any Hewlett Packard printer that’s compatible with them. This app requires a Wi-Fi connection. Another free app is Epson’s iPrint app which can be used for certain document types for a wide range of Epson’s printers. Even without all of these apps, you can still print from your iPhone or iPad. There are a couple of ways to do it. One is to move them to your computer with iTunes, and then print them with your computer’s printer. You can also use an online file sharing network to store your files, and then access them with your computer and print them.